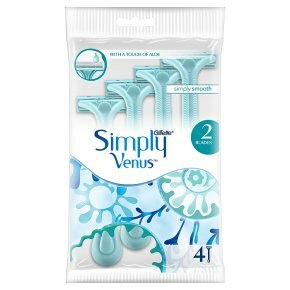 Gillette Simply Venus 2 Women's Disposable Razors provide a Venus-close shave at the most affordable price. This disposable women's razor features a 2-bladed head and a MoistureRich Strip for an easy glide to give you a delightfully simple shaving experience. Women's disposable razor with 2 blades. MoistureRich strip for glide and comfort. Teardrop handle for secure handling and perfect control. No razor blade change required; just use and toss. Gillette Simply Venus 2 women?s disposable razors provide a Venus-close shave. This disposable razor features 2-blades and a MoistureRich strip for an easy glide and a delightfully simple shaving experience.